Vicky Aridi (left) and Catherine Mumo. The two friends, leaders in different capacities, are always on the lookout for activities or events that might be of benefit to both of them. Opportunities may be right under our noses. They come in the form of phone calls or short interactions with well-established personalities in the professional world. Two Strathmore students who are adept at catching these opportunities and encouraging each other to be more and achieve more are Vicky Aridi, a third-year student at the Strathmore Law School, and Catherine Mumo, a third-year International Relations student. Both are UNICEF youth ambassadors and mentors for Bridge Academies. Vicky is also the United Nations Sustainable Development Solutions Network-Youth Kenya Coordinator and has completed the Kectil programme created to identify and nurture highly talented youth in developing countries who have the potential to make a positive difference in their communities and countries. Kate, the Vice President of the Student Council is currently going through the Kectil programme. The two friends have been in the same school and class since Standard One. During this interview at the Student Centre cafeteria, they often turn to each other for back up, and to fill in each other’s thoughts. They admit that they are each other’s mentors and are always on the lookout for activities or events that might be of benefit to both of them. They give insights on how they seized all these opportunities. Last year, you were among the volunteers who organized the UN World Children’s Day. Tell us more about that. Kate: The aim of the event, which was held at the Kenya National Theatre, was to bring together children from all over the country, each with different talents which they showcased. It was a privilege to attend this event because only select people were allowed to attend it. We got to meet dignitaries, learn from children from disadvantaged backgrounds and witness their achievements. Vicky: We met two communication specialists from New York. They told us what they wanted to achieve with the youth in terms of digital engagement and they wanted to know how we can help them bridge the gap between their content, and access the youth. Kate: One of the things during the event that left a mark on us was the messages the children wrote on ‘The wall’: don’t lose hope, keep carrying on, work hard, you can achieve your dreams. Vicky: We attended the Young Diplomats Conference in June last year. This was the second time we were attending this conference held annually. 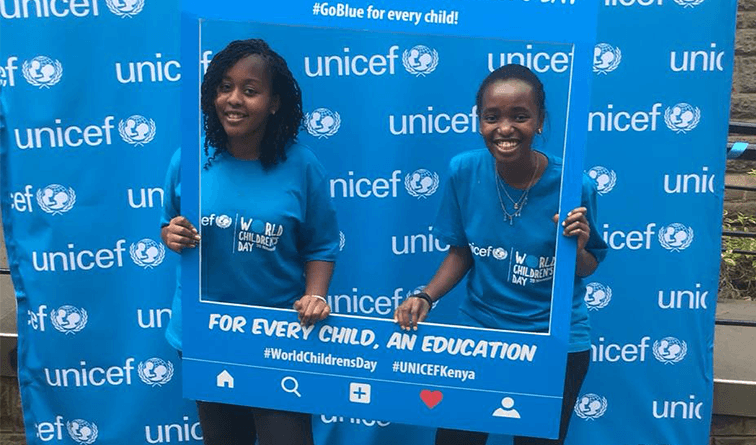 Kate: We were looking for opportunities, and as Vicky is the SDSN Youth Kenya coordinator under the UN, she was looking for a partnership with UNICEF and I was her sidekick. Vicky: At the conference, we met Luke Odhiambo, head of the youth ambassadors at UNICEF and exchanged contacts. After some time he got in touch to ask about the venue of the African youth talent summit that was to take place at Strathmore. After giving him the feedback on the details that he needed, he invited me for a roundtable event. Kate: He also called me with the same request. I found out more about it until I got the information he needed. Eventually, he invited me for the roundtable. Vicky: The reason he gave us the opportunity is that he had called a number of other people who had stopped at the answer ‘no’: No, we don’t know about the event; we are sorry we are not at Strathmore; we’re sorry, we can’t help. He told us the fact that we went an extra mile to offer him help without expecting anything in return made us stand out. Vicky: We are diverting from the traditional mode of job hunting. Potential employers will now ask you to give them a five-minute speech from which they make a decision as to whether to take you or not. Opportunities come to you at any time and place so it’s up to you to grab them. Kate: I think having the ability to capture the opportunity is key. Why would he remember us from all the people who had attended that conference? We didn’t expect this to evolve into a greater opportunity. There was only one other university student selected. Kate: It’s sometimes hard to combine our studies with this role. For example, we were selected to represent UNICEF Kenya as youth delegates at the African Youth Conference which fell during an exam period. We try our best to see how to balance but it’s quite hectic. We may not be able to travel to conferences or events in other countries as much as we would like because we have to put our studies first. Could you tell us about the UN Sustainable Development Solutions Network-Youth (SDSN)? Vicky: The youth wing was created in 2015 by Ban Ki Moon, who was then the Secretary-General of the United Nations. The role of the network is to bring young people together at the heart of sustainable development and to get them to collaborate with each other. Last year, after going through a series of five interviews, I was selected as the SDSN coordinator for Kenya. What did the interview process consist of? In stage one, we were required to fill in a series of questions related to personal details and to answer a few problem questions. There was a stage where we sent one-minute videos based on scenarios or on a Sustainable Development Goal (SDG), and on our personal story. This was challenging as I had to capture the message crisply in one minute. There was also a face-to-face interview with the previous SDSN coordinator. I was on probation for six months after which I was confirmed. How do you carry out your role? Do you work with others? We have the SDSN Youth Committee that is made up of 17 ambassadors, all of whom are from Strathmore. Each ambassador represents a specific SDG. We also have a communications committee which is working hand in hand with SDSN Youth Rwanda to run communications for the Great Lakes region. What avenues has it created for you? I started to interact with people you never dreamed of interacting with. Recently we met Douglas Mwangi, who won the Queen’s Young Leader award in 2018. We started a discussion on how we could run a mentorship project as he has an NGO called Oasis Mathare where he offers training to the residents there so as to equip them with skills for employment. Such people are doing amazing things and they challenge me to do more. What future events do you have planned? The creative works organizing committee is planning a creative works project for universities in Kenya involving creative writing, photography and arts while the arts festival committee is planning an arts festival. Both of these events will give expression to the SDGs.